Here’s hoping most of you were able to get out on the bike and enjoy the warm weather. I ride all winter long, but rarely get out of the city on my winter bike. It’s such a great feeling to get back out to the sights and sounds and smells of the country. Monday: Next Sunday is the beginning of Daylight Saving Time and that means today is the last MEAThead ride of the season. They’ll be back again in the fall after the easy weather is gone again. Tuesday: On Tuesday, the Madison Bikes Communications Committee will meet up at the Memorial Union. Check out the About Us section of our webpage for more info on any of the Madison Bikes Committees. For those that may not be fond of cold-weather riding, this week will give you a little taste of spring. Surely winter is not over, but the temperatures should be high enough to tempt the fair-weather riders. Enjoy some of the opportunities below or work on improving the city. Bike Fitchburg monthly meeting; 6:30–8:30 pm. Come to the meeting and let the folks working to make Fitchburg an awesome place to bike you’re your ideas and concerns. Fitchburg Public Library, 5530 Lacy Rd. The MEAThead Ride leaves from Ford’s Gym, 2114 Winnebago St 7:00 pm. The ride follows the lake loop with the option to add on a trip through the Arboretum. This weekly ride is ends the last week of March, so if you haven’t gotten to meet up for this ride yet and have been thinking about joining the group, the time is now. Madison Bikes Advocacy Committee; 6:00–7:30 pm at Bendyworks, 106 E Doty St #200. Stop by to see what this committee is planning or talk about any ideas you might have on what we can do on the advocacy front. Middleton Pedestrian/Bicycle/Transit Committee; 6:30–7:30 pm, Middleton City Hall, Council Chambers, 7426 Hubbard Ave. The agenda can be found here. Madison Bikes Development Committee; 6:00–7:30 pm, Colectivo Coffee - On the Square, 25 S Pinckney St.
Ontario Park Bike Path Meeting; 6:00–7:00 pm, Whitehorse Middle School, 218 Schenk St. Come learn about a proposed bike path through Ontario Park. This is a short path that makes a critical connection for the Whitehorse School kids and the Eastmoreland neighborhood. More information on the planned bike/pedestrian connection to the Capital City path can be found on the project website. Probably the event this week that holds the most interest for bicyclists is the Atwood Reconstruction Public Information Meeting that will take place at Olbrich Gardens on Wednesday from 6:30-8:00. This is your opportunity to both find out what the plans are and also ask questions. If you are either curious about what’s going to happen or want to express your opinion, here’s your first chance. On Monday, Sun Prairie Moves will host another Slow Roll, a fun, casual ride for all ages and abilities. The ride will start at Orfan Community Park and wil ride on paved city paths. For more information, check their Facebook page. Tuesday the Madison Bikes Communication Committee will meet at Memorial Union Terrace. All are welcome to attend if you would like to help us out with getting the word out about not just our activities, but important meetings across the city. Allowing the Police Department to donate abandoned and recovered bikes to non-profits. Previously, if the bikes couldn’t be sold at auction, the were required by law to send them to the landfill. The Council meetings in the City-County Building starting at 6:30. Anyone can speak on any item on the agenda. Just fill out a slip when you arrive. You will have three minutes to speak. Wednesday brings the monthly meeting of the Transportation Planning Board (the body that does transportation planning for the entire metro and urbanized area. A lot of the biggest projects in the area are discussed here, so if you want to know what’s up with big highway projects down to the regional bike network, these are the meetings where those discussions happen. You can find the agenda and materials for each item this month here. This month the meeting will take place in Verona because they will be considering land use and transportation plans for Verona this month. The Board tries to hold meetings around the region during the year to make things easier for people all over the affected area, but most regular meetings take place in Madison. If you have a meeting or event that you would like to have included on the Madison Bikes Calendar, drop us an email. Thanks to all that came out to support another year of Madison Bikes! Good to see faces old and new in celebration of all things biking in Madison. Thanks especially to our great hosts, the High Noon Saloon and for the amazing food served up by Jonny Hunter and Underground Food Collective. Door prizes and other support for the party came from Planet Bike, REI, Madrax, People for Bikes, Fiskars, and Revolution Cycles. A big thanks as well to all our other sponsors, donors, and supporters that contributed and helped support our work throughout the year. Our party also marked the official beginning of Bike! Bingo. If you were at the party, you’ve already got your card and the Special Events stamp. You’ve got until October 31st to fill your card(s). 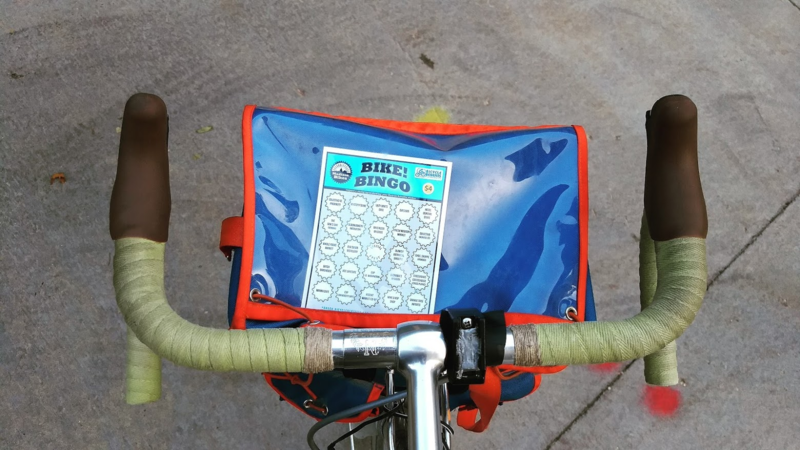 Check our website for a map of all participating locations, and go to the Bike Bingo Facebook page for more special events. All those in attendance also enjoyed the privilege of being the first official Madison Bikes members. If you couldn’t make the party, stay tuned over the next couple of weeks for details on how you can join as well. 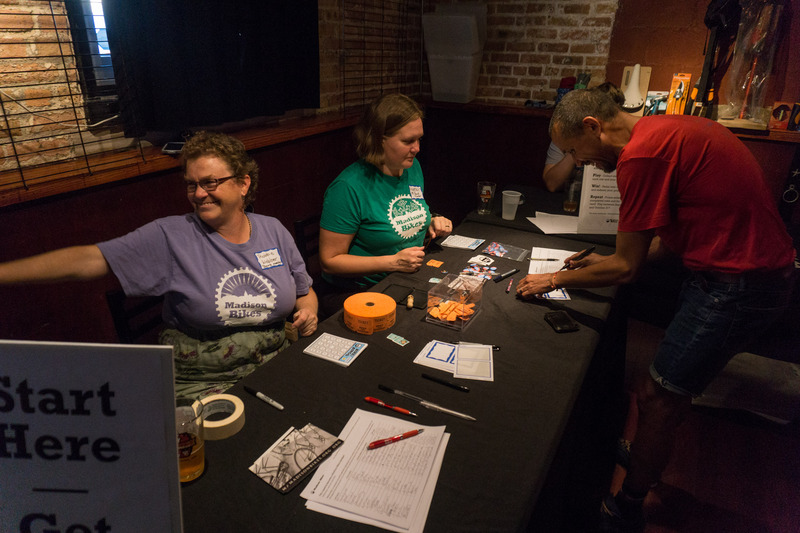 Madison Bikes has a great group of people on its Events Committee, but could always use a couple more passionate and creative people to help. This month’s meeting will recap our Annual Party and switch gears to focus on the upcoming Winter Bike Fashion Show. As an added incentive, this month’s meeting will happen by bike, coinciding with the Mondays Around Monona ride. Meet up at Fair Oaks and the Cap City path at 6:00p on Monday for a beautiful lake loop rolling meeting! On Tuesday, there are a couple items of interest on the Common Council agenda for those that bike. The big one will be the updated recommendation from the Transportation Ordinance Review Committee to restructure our city transportation commissions/committees and to hire a Director of Transportation. The resolution has a number of cosponsors and looks to have broad support by the council. Another item of note is a permit for a railroad crossing for the planned Capital City Path extension east of Buckeye Road. This is the next step in eventually connecting the route all the way to Cottage Grove. On Wednesday, the Board of Public Works will vote to recommend approval of an ordinance change that will permit riding on the State Street/Library Mall section known as Philosopher’s Grove. The curb cut that allows for improved access through this important connection was completed last week. One public comment critical of the proposal is on file with the Board at this time. The Pedestrian, Bicycle, Motor Vehicle Commission voted to recommend adoption at its last meeting and hopefully the Board of Public Works will do the same. Consider sending a quick email in support to the members of the Board before Wednesday. Also on Wednesday, the Madison Bikes Advocacy Committee will have its monthly meeting at 6:00p at Bendyworks and the Marquette Neighborhood Association will have a special meeting to review the recommended design coming from the Nolen/Blair corridor study. On Saturday, bring the family out for the Tour de la Familia Latina at 10 am and then help support the Audubon Society with the Birds, Bikes, and Brews ride at 1 pm. And finally on Sunday, there’s a action packed Bike the Art ride beginning at 1:30p. The ride will start at Promega's BioPharmaceutical Technology Center and then head to Centro Hispano, the Edgewood College Gallery, and will end with Shakespeare in the Park at the Arboretum. Not much to report from last week, but there are some interesting happenings in the week ahead. 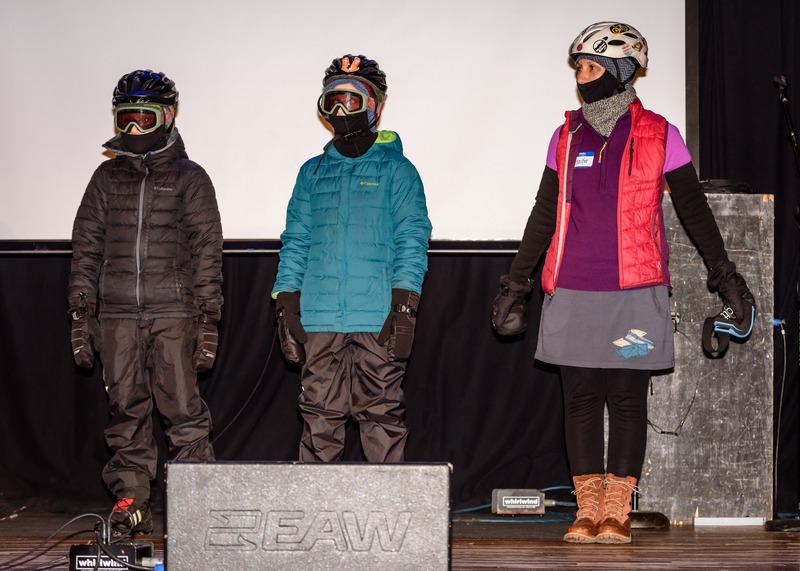 On Monday, both the Madison Bikes Board and our Events Committee will meet with a focus on the final preparations for our Winter Bike Fashion Show at High Noon Saloon. You can still send us pictures of your winter bikes, gear, and adventures at winterbike@madisonbikes.org, to be featured on the blog and/or at the Fashion Show. On Tuesday, get yourself to your polling place (if you haven’t already). Madison B-Cycle is offering free rides on election day, so there’s no excuse. On Wednesday, the Bicycle Facility Maintenance Maintenance Policy Workgroup will meet to review the draft Bikeway Maintenance policy along with a first draft of a map that will help winter cyclists identify which routes receive priority clearing after a snow event. If you’re looking for one meeting to attend this week, I’d suggest Thursday’s East Johnson Street Reconstruction Meeting. Engineering will unveil their updated plan based on feedback from their first public meeting earlier this year. This will be a critical connector between Baldwin and First Street and will also include some potentially big alterations to First Street as well. Come see the plans and share your thoughts with city staff. On Monday, Robbie and I had a nice chat with Brian Standing on WORT’s 8 O’Clock Buzz. Check it out here or on the WORT FM website. As a reminder, you can find all past news coverage of Madison Bikes here. 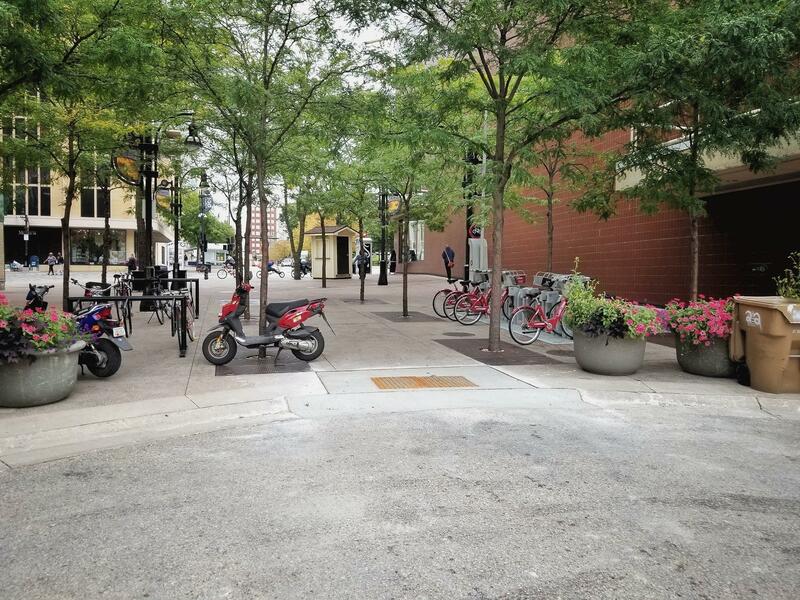 Tuesday’s Pedestrian, Bicycle, Motor Vehicle Commission meeting had a full agenda including a first look at a number of upcoming cross sections and a review of a new Request for Proposal for the Downtown Bike Center that will be built at Judge Doyle Square. I raised a number of questions and concerns about the RFP, referencing details found in this 2012 Report. While I’m very supportive of the bike center in concept, I think there’s a good chance of it failing if it’s not implemented and operated effectively. What could be worse publicity than a $1M bike investment in the heart of downtown that goes underutilized? As always, PBMVC meetings are available to watch online for anyone interested in tuning in live or watching the recordings. And while I was at PBMVC, Harald stopped in at Hotel Red for the Regent Street/South Campus open house. A neighborhood plan was already adopted back in 2007. But while that plan sets some priorities and parameters for development, this open house was intended to carry the conversation forward and look at various options for bringing the plan to life. 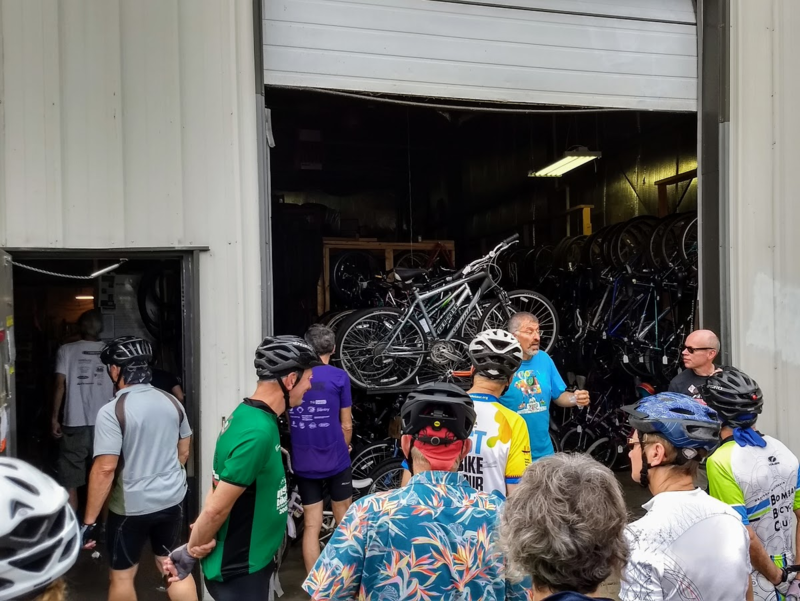 Biking featured fairly prominently, with ideas like improving the SW Path or to "explore bike opportunities" in the area of Regent Street where Budget Bicycle Center is located. Providing bike facilities on Regent Street, however, didn't seem to be part of any plan. It didn't become clear during the open house what the next steps are going to be or who to direct feedback to. On Wednesday, the Transportation Ordinance Rewrite Committee continued its work on reimagining and rewriting Madison’s transportation ordinance. It seems like the group has settled on the concept of creating a new Transportation Planning and Policy Board and is looking at potentially combining all of the other transportation commissions into a new single Transportation Commission. While there is certainly value in connecting the dots between the various elements of our transportation system, the new commission is currently drafted to have only seven seats with no requirement for representatives from any of the transportation modes that we are trying to strengthen (ped, bike, transit). This is really important and fundamental work, so please stay tuned and be ready to advocate to keep cycling’s seat at the table. On Thursday, Alder Eskrich and city staff rolled out their vision for a reconstructed Monroe Street. After months of planning, a series of public input sessions, and an online survey all calling for significant improvements to pedestrian and bicycle accommodations and a commitment to green infrastructure, the proposal instead continues to prioritize motor vehicle throughput and on-street parking by not changing anything. That’s right: The rush hour travel lanes and miles of underutilized street parking will remain untouched and people on bikes and on foot will continue to watch from the sidelines. There’s a lot to dig into with this project and, in particular, the failed public engagement process. The proposal will go to the Pedestrian, Bicycle, Motor Vehicle Commission in November, Board of Public Works in December, and then will look for final approval at the Common Council meeting in January. 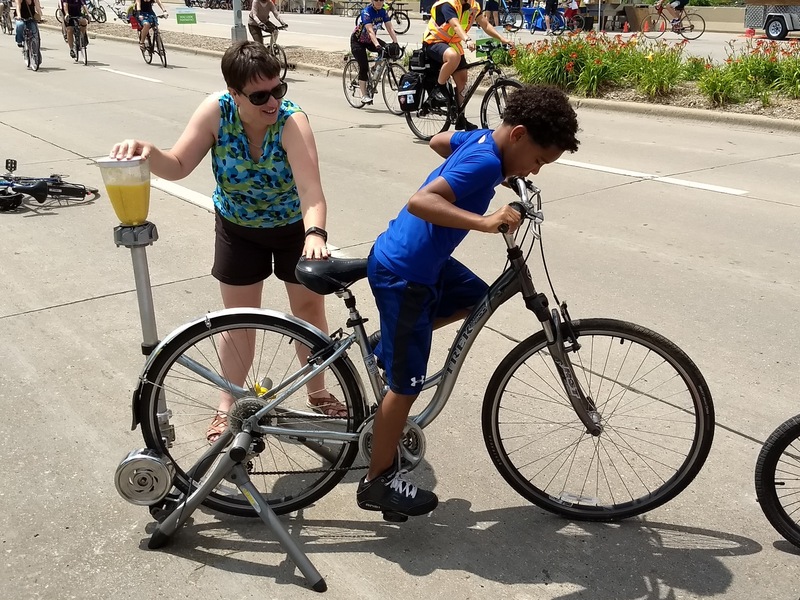 There are two opportunities to get involved directly with Madison Bikes this week. On Tuesday, join the Communications Committee at Cafe Hollander and, Wednesday, meet up with the Advocacy Committee at Cargo Coffee. Check the calendar for details and feel free to stop in and check it out. On Thursday, there’s a Public Market Site Design workshop: “As the City continues to make progress on implementation of the Public Market, this workshop will be an opportunity to discuss the site design and how the Public Market connects with surroundings amenities, natural features, properties, infrastructure, etc.” Getting meaningful access by bike is often best accomplished at this early design phase. And, on Friday, you have an opportunity to support the Bike Fed and statewide bike advocacy by attending the 2016 Saris Gala. 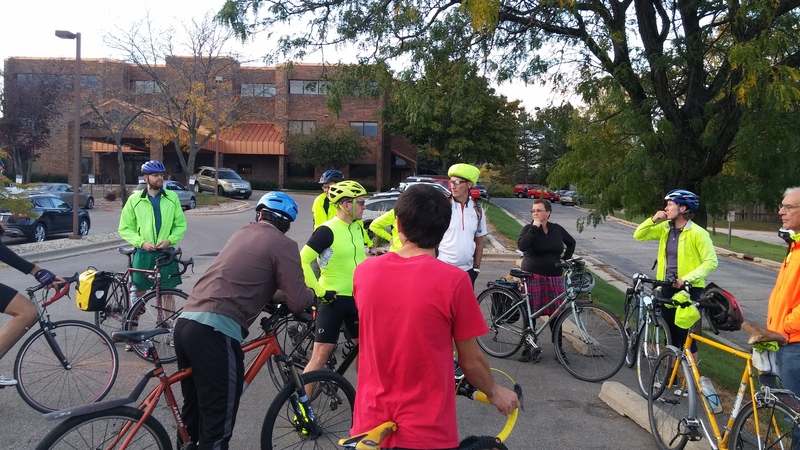 The week started out with an event in Middleton: Local cyclist and bike advocate Kierstin, who the week before had been forced off the road by a person driving aggressively, organized a Middleton Bike Infrastructure Ride on Monday evening. 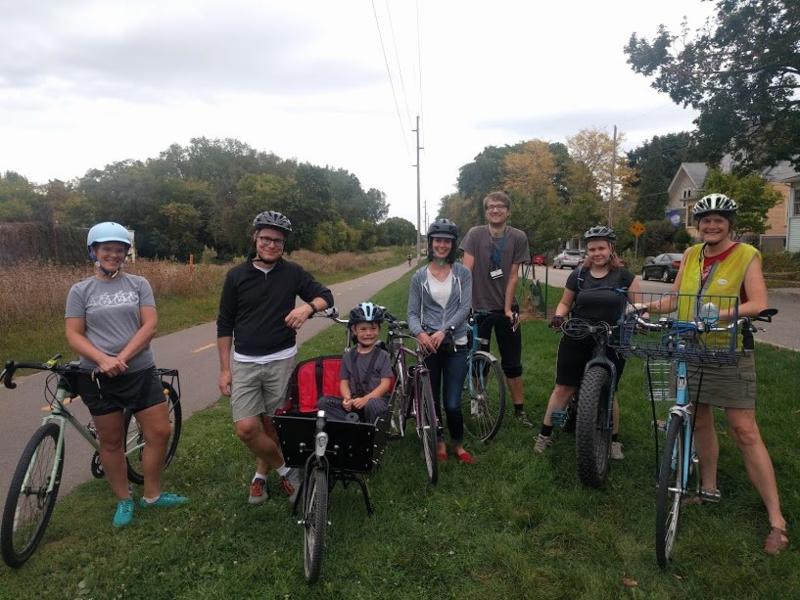 The ride showcased some of the significant gaps in the bike network in Middleton and brought together both local advocates and supporters from Madison (and Madison Bikes...). Kierstin will publish a guest post about her the ride and her efforts on the Madison Bikes blog later this week. It turns out all the traffic at Warner Park on Thursday was actually there to watch the Mallards play and not to carry in hundreds of participants for the Regional Transportation Plan 2050 Public Involvement Meeting. In fact, I’m not sure if there was anyone in attendance who wasn’t a staff person, transportation committee member or reporter. I didn’t stay for the whole slide deck, but I did look at all of the maps that depicted current and future bike routes. I think there’s a lot of work needed on these maps to make them meaningful sources of information. On the pedestrian side, there are clearly marked Tier 1 and Tier 2 priority gaps that are prioritized for improvements. On the bike side, there’s no way at all to tell where the most important gaps are currently or how we should go about prioritizing. Until we start clearly identifying our current All Ages and Abilities/Low Stress bike network and the missing links, we’re going to continue to struggle to make any real headway. These maps aren’t up yet, but should be available online soon. Monday: The Madison Bikes Events Committee meets to continue planning for the Winter Bike Fashion Show slated for Saturday, November 19 at the High Noon Saloon. 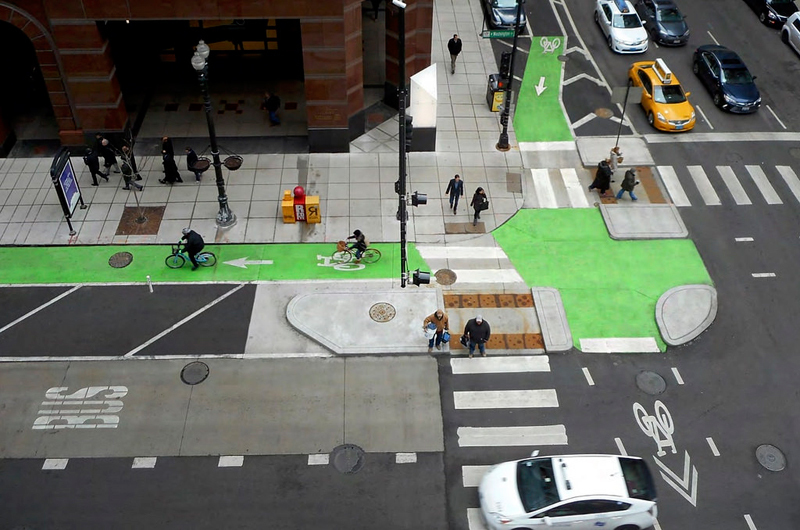 Wednesday: On Wednesday, City of Madison Traffic Engineering is hosting a Webinar & Chat: Safer Intersections for Peds & Cyclists at the Madison Municipal Building at 2:00pm. The event is open to anyone, but please RSVP on the linked Facebook page. At 5:00, the Transit & Parking Commission meeting begins and will include an informational presentation on a potential bus route move from Jenifer to Williamson Street. Also at 5:00 will also be another chance to see the Regional Transportation Plan 2050 presentation, this time at Middleton’s city hall. Thursday: Madison in Motion Oversight Committee meets for the first time since June. They’ll be reviewing the public input received to date and discussing next steps. Also on Thursday will be your last chance to catch the Regional Transportation Plan 2050 presentation, this time in Fitchburg.